The Elland & District Partnership are still looking for interested people to join them in their various activities to improve the Town. They meet bi-monthly and try to influence any decisions which affect the area. If you are interested and wish to help, their next Open Meeting is on 10 October at Willow Court starting at 7pm. This entry was posted in Elland, Events, Greetland & Stainland, Oct and tagged Elland District Partnership. Elland and District Partnership AGM – Public Notice! The annual general meeting of the Elland and District Partnership will take place on Tuesday 4 October 2016 at Willow Court, Victoria Road, Elland. The meeting will commence at 7pm and will be followed by an open meeting. This entry was posted in Elland, Get Involved / Have Your Say, Oct and tagged Elland District Partnership, Meeting, October, Open Meeting, Willow Court. 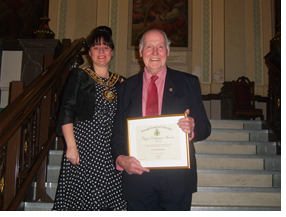 Calderdale Council has always celebrated the work of individuals who have contributed to their communities and to recognize the efforts of outstanding individuals within Calderdale the Citizen Celebration Award was established in 2014. To encourage and enable participation, the award was promoted through Ward Forums, councillors, partner organisations and local networks and this year there were 50 nominations from the 17 council wards with one or more nominations in each ward. 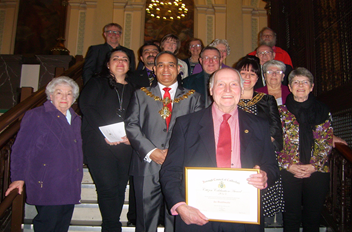 The Ward Councillors in each area worked with Neighbourhood Teams to put a winner forward who would represent their area at the Calderdale Citizen of the Year Celebration event held on Wednesday 24 February 2016 at Halifax Town Hall. The Civic Advisory Group went through all the nominees put forward to choose the winner Mr Joe Braithwaite, chairman of the Elland and District Partnership, who was awarded a certificate and a contribution of £250 for a community initiative by the Mayor of Calderdale, Councillor Lisa Lambert. This entry was posted in Elland, Feb, Get Involved / Have Your Say and tagged calderdale, Celebration, Citizen Celebration Awards, Elland District Partnership, Halifax Town Hall, Press Release. Sadly, thousands of older people in the UK spend the festive season on their own, and in Calderdale over 200 older people won’t have received Christmas presents this year. Local group ‘Let’s just do it Elland’, sponsored by Elland & District Partnership and supported by a team of volunteers held a festive feast with exciting entertainment at Elland Cricket Club on Christmas Day, to bring festive cheer to isolated people aged over 65 in the local community which saw over 30 elderly people come together and receive gifts when they would usually celebrate Christmas alone. Guests gathered for a three course lunch and enjoyed a traditional brass band, a singer performing 1940s and 1950s classics and many local businesses donated goods which added to the overall success of the day with 100% positive feedback and early requests to repeat the event next year already received. Door to door transport was also provided in mini buses loaned from the Maurice Jagger Centre, Halifax, driven by volunteers and a number of meals were delivered to the homes of those unable to attend. Elland & District Partnership is one of four community ‘hubs’ in the borough, established as part of ‘Staying Well’ – a project by Calderdale Council and Calderdale Clinical Commissioning Group (CCG) to help tackle loneliness and isolation in older people, improve wellbeing and create more connected communities whilst reducing GP and hospital visits as well as early entry into residential care. The project helped to fund the event on Christmas Day, as well as many other activities this year to bring lonely people together – from lunch clubs and coach trips to IT training, befriending, exercise classes and many more. This entry was posted in Dec, Elland, Get Involved / Have Your Say and tagged Christmas, December, Elland, Elland District Partnership, Elland Staying Well, Maurice Jagger Centre, News, Press Release, Staying Well.